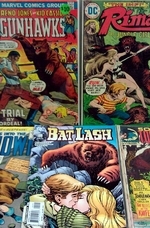 Who knew there were so many comics about bears attacking people?Adam and Shawn (drinking the Adagio tea of Cara McGee) attended the annual Borderlands Comics and Games sale in Greenville, SC. Like the years before it in stock were thousands and thousands of 3 for $1 comics. As a special bonus this year Borderlands’ owner Rob Young dropped prices for the last hour to 10 for $1. It looks like it pays to dig all day as long as you can overlook the back pain and sinus damage.